The Kingdom of the Netherlands has designated Mullet Pond in Sint Maarten as its 55th Ramsar Site. Mullet Pond (Ramsar Site no. 2270) is a semi-enclosed area of permanent shallow marine waters within the Simpson Bay Lagoon. The Site holds some of the few intact sea-grass beds in the wider Lagoon as well as 70% of the mangrove forest remaining on Sint Maarten, the Dutch part of the Caribbean island of Saint Martin. The mangroves and sea-grass beds act as a major nursery area and important habitat for juvenile fish species which develop in the lagoon before moving to local coral reef ecosystems including in the Man of War Shoal Marine Park. The nationally critically endangered buttonwood Conocarpus erectus is found on Mullet Pond. The Site is also the last remaining habitat in the wider Simpson Bay area for Anolis pogus, a species endemic to the island, and the last intact foraging grounds in the Lagoon for the globally endangered green turtle Chelonia Mydas. 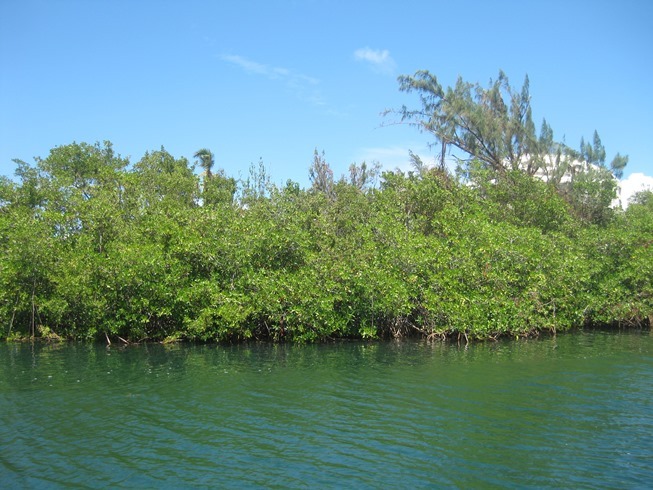 The mangroves provide coastal protection during hurricanes and tropical storms, and help to cycle nutrients in the larger Simpson Bay area. As well as supporting the fish stocks which local fisheries depend on, the Site is also used for eco-tourism activities such as kayaking tours. The area is under continuing pressure from development, while other threats relate to dredging, recreational and tourism activities, storms and flooding and invasive alien species including the red lionfish Pterois volitans.